Upgrade (to HW3.0) fate of AP.2.0 owners who purchased FSD? Discussion in 'Model X' started by Big John, Apr 15, 2019 at 2:51 PM. I was thinking about the fate of MX/MS owners who have AP 2.0 that have purchased FSD. There have been ambiguous and contradictory statements regarding the upgrade path to AP 3.0 hardware. At first Elon tweeted that there would be an FREE upgrade path to HW 3.0 for all AP 2.0 and higher owners who purchased EAP. I. like many others quickly bought the FSD package in response to this announcement. Then later there was a "clarification" that the free upgrades were for Gen 2.5. There has been no further clarification or information regarding and upgrade to HW 3.0 for AP 2.0 who purchased FSD. So what do you think will happen?-- 1) AP 2.0 owners will be able to get HW 3.0, but later. 2) Will be able to get but with functional limitation. 3) Will be able to get only if they pay additional $$ for additional retrofitting to bring AP 2.0 to AP 3.0. 4) So sorry, 2.0 will not be able to be upgraded to 3.0. Tough bounce. 5) FSD will really not work properly without HW 3.0 and upgrade from 2.0 to 3.0 is not possible, so here is your $$ back. What do you think? I don't know how to set up poll or I would have done so. We have a AP2.0 Model X and opted for FSD at time of purchase. Since that time I've seen Elon say several times that *everyone* who purchased FSD will have their hardware upgraded to support it for free when it becomes available and I haven't heard anything (even rumor) to the contrary before reading your post. Can you point to something that makes you doubt this? Elon: Please note that the price of the Tesla Full Self-Driving option will increase substantially over time. Greg: My car came out 2 months before the upgrade. Can it be retrofitted? It's crystal clear that the AP 2.0 + FSD vehicles will get upgraded to HW3 for the computer. This will be a free upgrade. What isn't clear is how Tesla will handle the sensor/radar differences between AP2.0 and AP2.5. 1. Tesla swaps the cameras, the RADAR, and the wiring (unlikely). a. Uses software to copy the data from one side of the AP computer to the other (moderately likely). 3. Tesla swaps in the new board and uses software to convert all of their neural net training data from full-color to the red-and-greyscale color space produced by the existing cameras and trains a second copy of the neural network for those cars and then does either a. or b. from #2. 4. Tesla does a partial camera upgrade and does something in between those options. 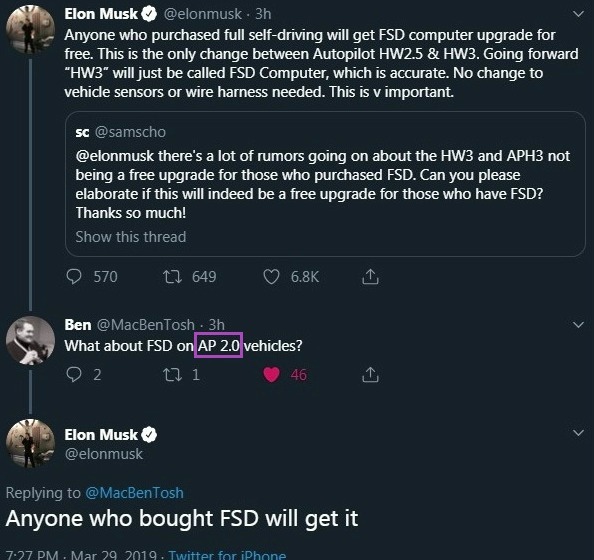 If the final FSD deliverable for AP2.0 folks doesn’t meet federal requirements due to a lack of redundancy that exists in HW3 and HW2.5->3 upgrades then that’s going to be a big issue. I have little doubt that if they ever get level 4-5 autonomy working and approved at the Federal level then they’ll do right by the folks who paid them $3k for the promise way back in 2016. Dunno what that will end up looking like but I wouldn’t be surprised if they’ll do it even if it means rewiring the sensors. As time goes on it’s a smaller amount of vehicles in both relative and absolute numbers, and they’ll be more willing to take a loss on the upgrade than face the PR hit and inevitable class action. As Elon has stated previously, the changes from hw2.5 to hw3.0 is only the computer. The difference between hw2.0 and hw2.5 are only redundancy enhancements. The hw2.0 with the new fsd computer will be hw3.0 capable just not *as* redundant as hw2.5 that gets upgraded. That's how I understand it. The hw2.0 upgraded with new fsd computer will be more than capable of fsd. Thanks all for the research and postings. I feel reassured that (eventually) I will not have wasted my $ upgrading to FSD. There is ample documentation that a free upgrade to HW 3.0 was promised to make reneging on that promise difficult. I actually can't see myself going to sleep until my destination--But I like driving with EAP so much that improvements in computational speed, smoothness in execution and the absence of any nags will make traveling more pleasurable. One advantage of AP that has not been mentioned is the enhanced safety for older drivers whose reflexes and acuity are not what they were--even night driving. As a 70 year old who loves to drive the FSD makes loads of sense as I age. The MX is so much fun to drive and even us old codgers appreciate the wow factor and admiration that the MX provides. Thanks all again for the reassurance. I haven't read anything other than people saying the cameras as different. Let's say the are. The only difference would be the color thats being stated. If thats the case then I assume the only camers that matters is the one in the windshield. That would be the only camera reading traffic lights. I see that being an easy swap for Tesla even on site. All that needs to be removed is the side A-Pillar to feed the new camera. Thats if the current wiring harness isn't a plug and play. If it is thats an easy upgrade. Why does everyone seem to think the side cameras need to be upgraded? I’ve seen a lot of discussion on the redundant wiring that AP 2.0 is missing as compared to 2.5. Thinking a lot more wiring is required if we’re going for parity with newly build AP 3.x cars. Why would any camera other than the main camera behind the rear view mirror need different colors. The only critical camera I can see is the one reading traffic lights. Swapping this camera out with wiring would be really easy and should be able to be done via mobile service with no issues. They never said you get parity, they said you get the new APE. To clarify: It's the AP hardware that will be upgraded. There are 2 (or more) processor units in the car, but the 2 involved are the APU and the MCU. With AP2.0 you have the AP2 hardware and MCU1 unit. MCU2 came out mid-2018 and hence AP2.5 was realized. If you have AP2.0, the APU will be upgraded to AP3 for free if you've purchased FSD, but the MCU will not (unless there's unforeseen compatibility issues but that is speculative at best). There is also speculation about an upgrade to the MCU being available in the future, but it's not been announced and it's a cost to the owners of ~$2500 from what I've read. It would be a pretty involved change as there are wire harness changes, camera changes, and possible an IP panel replacement involved). Given all the changes with Tesla service I wouldn't hold my breath on this one. So far as the B&W cameras vs color, I would think there's enough color coded signs, traffic lights, turn signals, etc that might require more cameras to be color, if not for redundancy's sake. A lot of chatter in the thread about color cameras.. this is a computer, not a human.. I would expect it can reliably tell the difference using greyscale and enough sample data. I'm more comfortable with a color blinded human than I am a color blinded computer. But, we shall see what they do. What I think they do? they won't upgrade the sensors, and instead they'll accept a little less redundancy in traffic light detection and other areas where color would be useful. But, I do hope they upgrade the sensors to lessen the number of differences that have to be validated to enable L3/L4 driving. MCU2 had nothing to do with AP2.5 and was released months after AP2.5.